Steelhead fishing has been phenomenal the past several days. We are now heading into the peak weeks with big number hook ups, and lots of fish! Fly fishing now takes center stage with good numbers of Michigan Spring Steelhead on gravel and actively spawning. Water temperatures are perfect at 42 degrees. Visibility is very good, over 10′ visibility. Sight casting to fish is now an option. Fly Fishing for spawning Spring Steelhead has made for some double digit days on the Muskegon River below Croton Dam, just upstream of Newaygo, Michigan. Finally! The moment we’ve all been waiting for! Our first good push of Muskegon River Spring Steelhead. Bright Silver Steelhead just showed up over the weekend. Water temperatures are still cold but we have seen many Steelhead beginning to spawn and hit gravel in some locations. Spinning fishing light tackle with floats and spawn, trout beads, and jigs and waxworms. All of which are fishing very well. 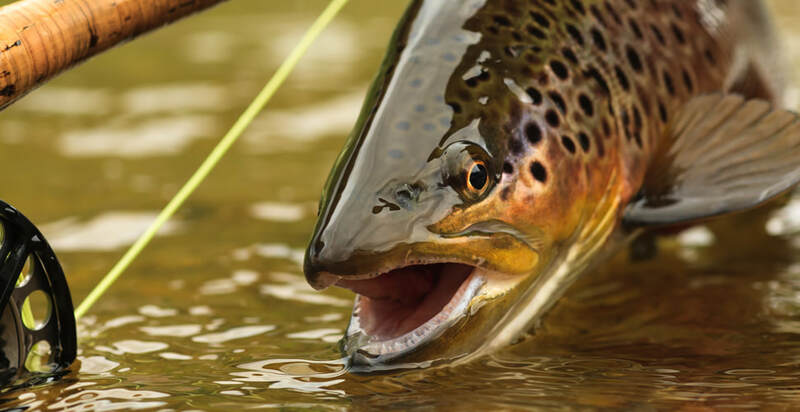 Fly fishing should pick up later this week as water temperatures begin to warm, and spawning becomes heavy. Water levels are finally back to normal Spring levels. Muskegon River is running at 5440 cfs. Clarity is very good at 5′ and clearing. We had an excellent day fishing with Greg and Luke. We landed a ton of nice Steelhead this morning. I feel like today marks the first batch of Muskegon River Spring Steelhead. Lots of Steelhead now entering in from the lake with the major push starting this week. What’s working? Jigs tipped with wax worms worked well for us this morning. Florescent colors seemed to work best. Trout beads have also been working well. medium sized spawn sacks in chartreuse and pink, all working very well. Small jigs tipped with small ice fishing plastics have also been good. 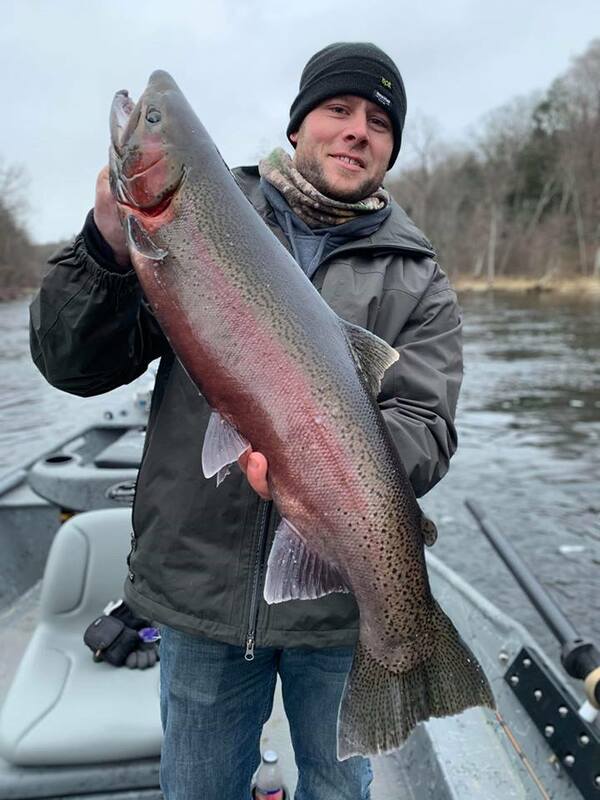 Michigan Steelhead Fishing Reports – Muskegon River. Fishing fresh steelhead spawn has been excellent. Smaller spawn sacks in natural colors have been fishing well. Steelhead Trout Beads, in natural, 6mm and 8mm all fishing very well. Starting to see a few early spring stone flies. Fly Fishing should become a major thing during the next several weeks as steelhead gorge on stone flies. Evan displays a gorgeous Spring Steelhead. 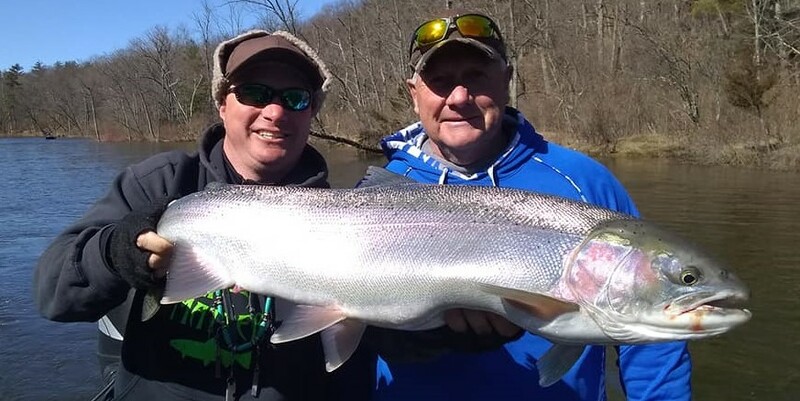 Some our best Spring Steelhead fishing takes place during late February and early March. 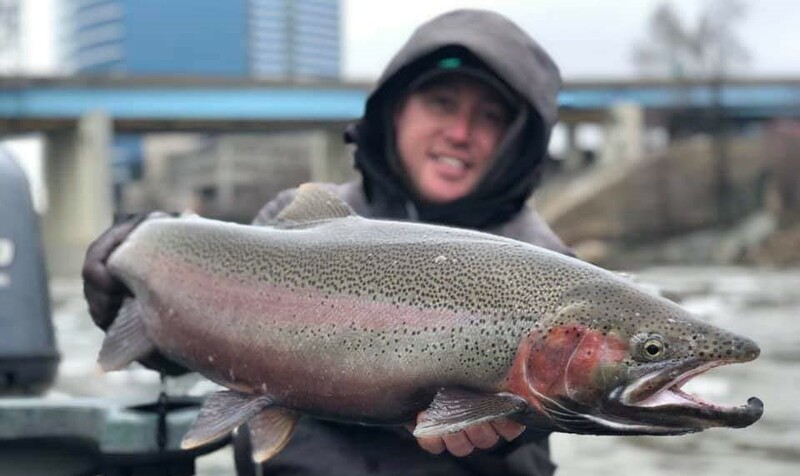 Steelhead feed heavily on King Salmon Fry, Gobies, Sculpin, Scuds, Green Caddis, and after waking up from Winter’s slumber, Steelhead absolutely love the late Winter Stonefly. Trout beads drifted along the bottom perfectly represent Brown Trout or King Salmon eggs. Hand painted trout beads look identical to salmon eggs. Flies that represent Scuds, Sculpins, and Coho Salmon fry are also very effective near the Croton Dam. The Muskegon River never freezes so we fish all winter long, offering great fishing year around. 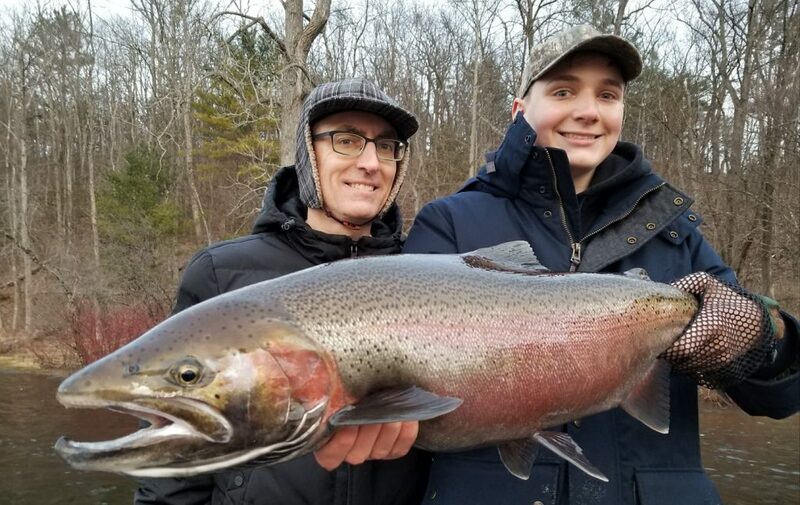 Drifting Trout Beads, tiny spawn sacks, or jigs tipped with wax worms has been fishing best for Muskegon River Steelhead, Brown Trout, and Salmon. 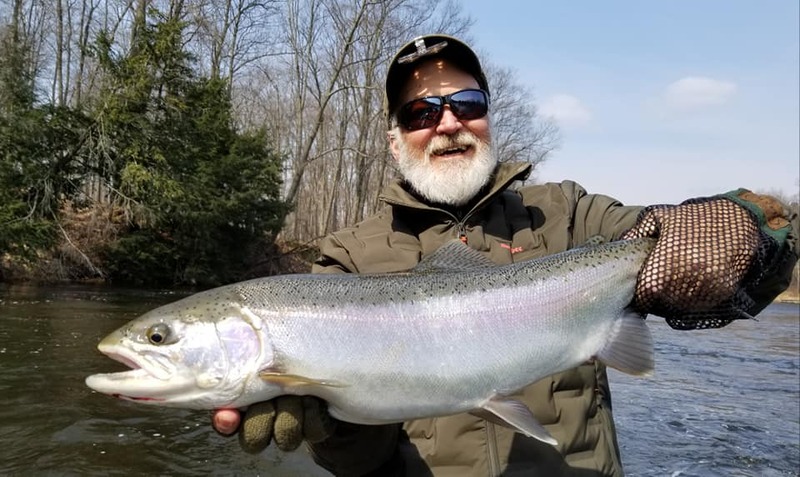 Good numbers of Michigan Spring Steelhead throughout the main Muskegon River. Lower sections near Maple Island, Bridgeton, and Newaygo are all fishing well. Pine St and the Croton Dam have lots of resident trout and spring steelhead. There should continue to be steelhead well through the spring months. Steelhead usually peak here in late March and early April. Spawn sack and Bead fishing is going well right now. Bright Steelhead entering the river. 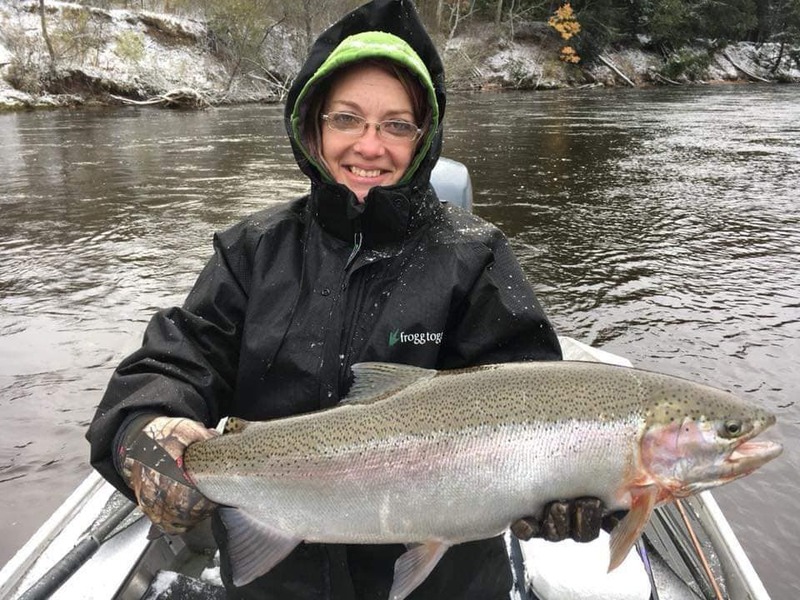 Recent rain has greatly improved the Steelhead fishing on the Muskegon River. The middle sections have been fishing well. Pine Street to Henning seems to have the most fish. 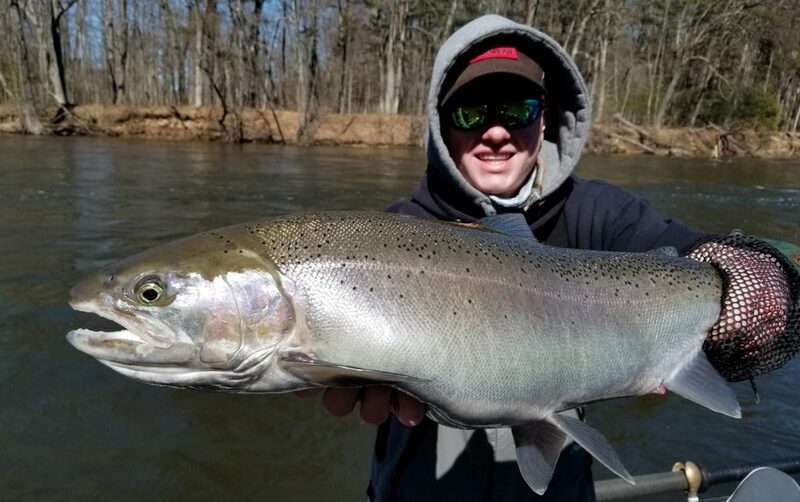 We are now starting to see good numbers of Muskegon River Fall Steelhead entering the lower Muskegon River near Giles and Maple Island. Fall steelhead ascend the river to feed during the fall months. King salmon eggs are the main food source for steelhead during November. Trout beads, small spawn sacks, crank baits, and swung flies all fish well for Steelhead this time of year. Water temperatures play an important role for migratory fall steelhead. 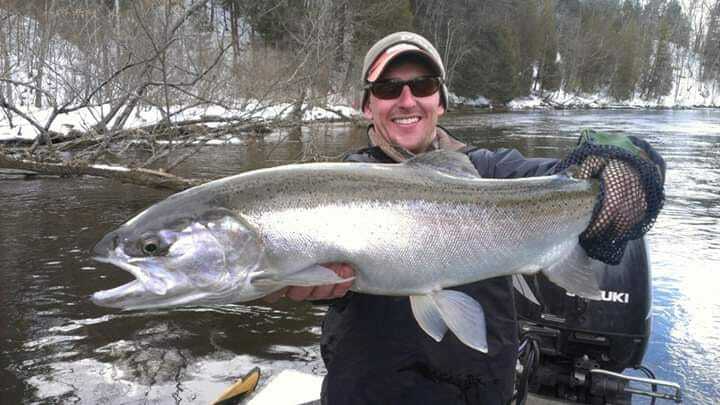 The best water temperatures for Steelhead in Michigan are between 55 to 45 degrees. 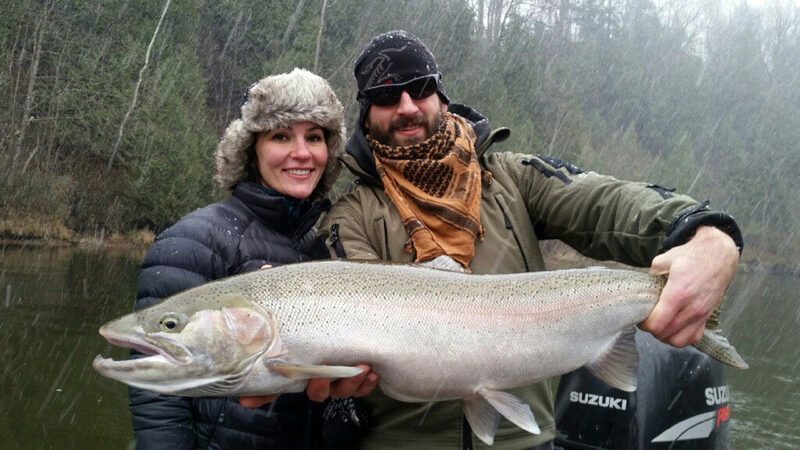 These water temperatures make for excellent steelhead fishing in Michigan. Screaming drags, incredible jumps, and mean head shakes make for thrilling fights with Michigan Fall Steelhead. 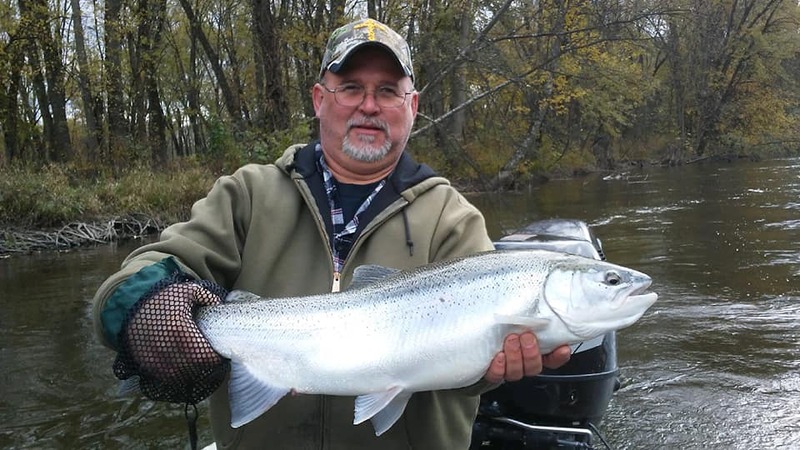 Croton Dam to Newaygo offers some of the best Fall Steelhead Fishing in Michigan. Excellent runs and deep pools in this section of river, it offers great holding water. 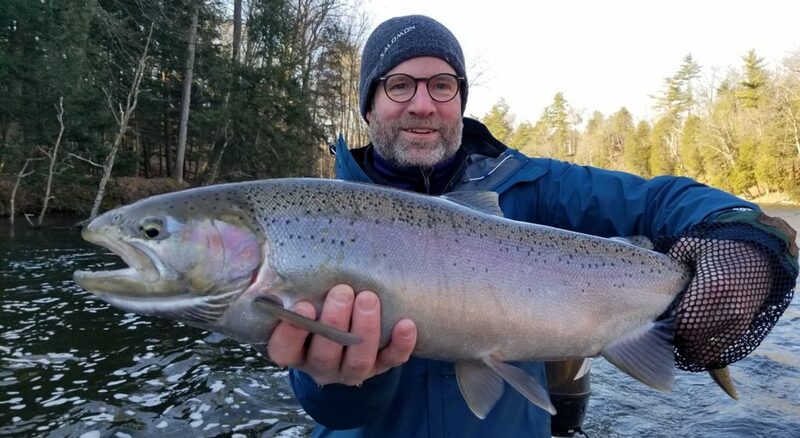 Pine St to the Thornapple access also has fantastic trout fishing for Rainbow Trout, Brown Trout, King Salmon, and Steelhead. Smallmouth Bass can be found here during the Summer Months. 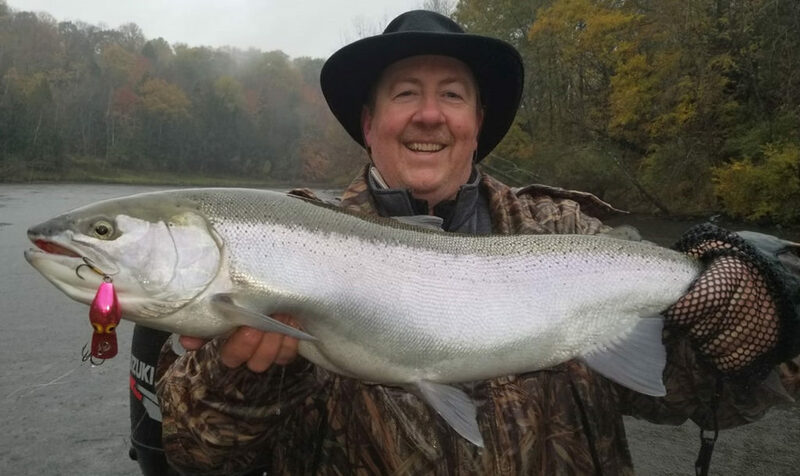 Muskegon River Steelhead Fishing Reports for the Croton Dam and Newaygo Area for Trout, Salmon, and Steelhead. Trout fishing remains strong. Good numbers of Muskegon River Trout feeding behind the spawning King Salmon near the Croton Dam. Fishing Reports for the Muskegon River near Newaygo. MUSKEGON RIVER STEELHEAD is the ultimate game fish and the crown jewel of Michigan Rivers. Steelhead are the only freshwater game fish that will strike a fly savagely in 35 degree water, leap relentlessly, make blistering lightning quick runs, and test every fly fishing skill you possess. Honest 18lb Steelhead! No doubt the largest year class of steelhead since the mid ’90’s. Steelhead are plentiful and huge this year! Like Salmon, Steelhead are born in rivers but spend their growing years in larger bodies of water. Our great lakes Steelhead return to the rivers when they reach sexual maturity after three or four years of growth in the big lake. After spawning commences in late spring Steelhead migrate back to the big lake and start the process all over again the following years. These beautiful fish average 8-10 pounds with an occasional monster caught close to 20 pounds each year. Join us for an experience of a lifetime fishing for one of the most sought after fresh water game fish in the world. These world-class fish are available in the fall, winter, and spring. Fall Steelhead fishing is your best opportunity throughout the year to experience the true power these fish have to offer. These Great Lakes Steelhead migrate into our rivers in October following the migration of the Chinook or King Salmon. These bright silver bullets cruise behind spawning salmon redds in search of discharged eggs. 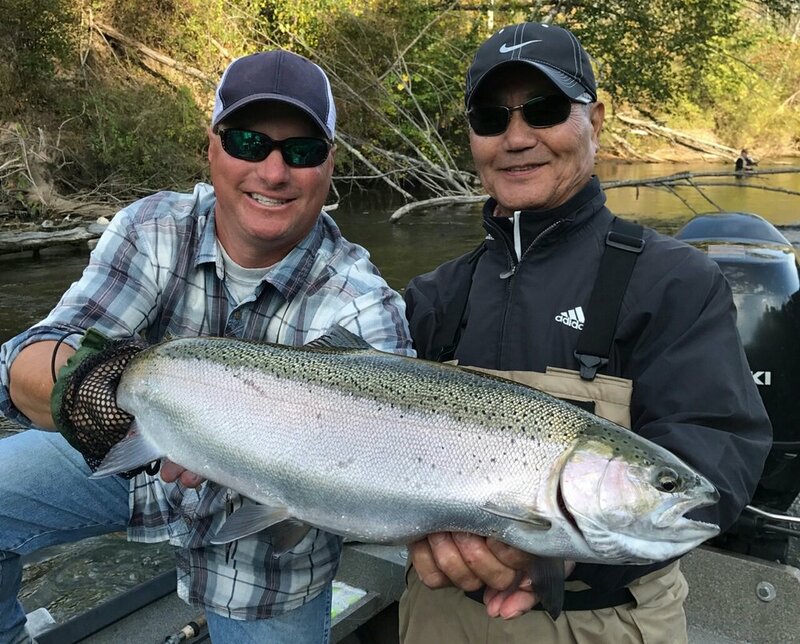 If you truly want to experience Steelhead fishing at it’s best, join us for a fall Steelhead fishing trip. You will not be disappointed! 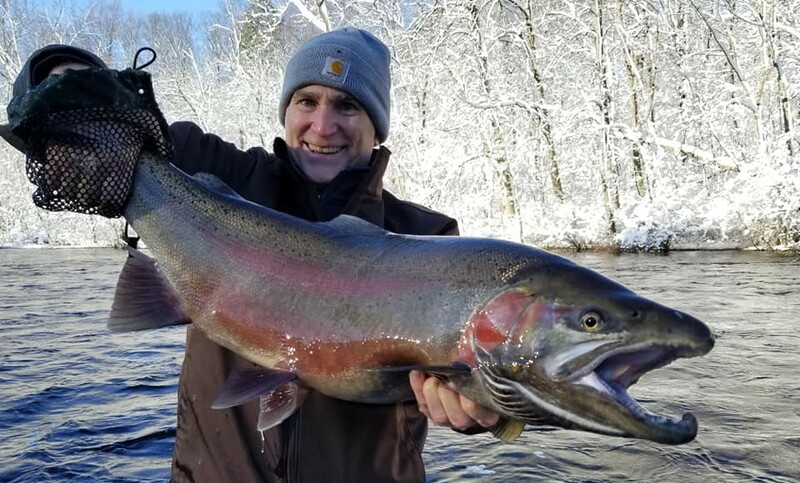 Winter fishing for Steelhead is one the best kept secrets throughout the Muskegon river system due to numbers of fish throughout the river and you virtually have the complete river to yourself. 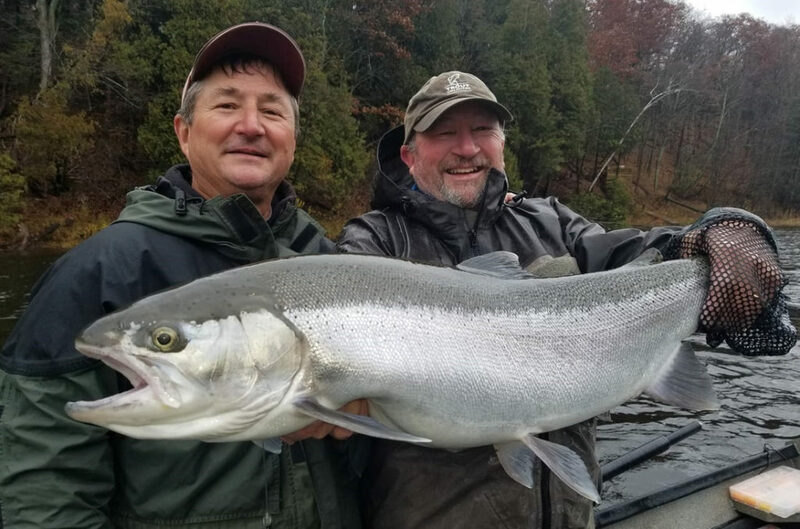 Steelhead will ascend the Muskegon river all year long due to its warmer tail water and ice free flows providing for some spectacular fishing December through February. 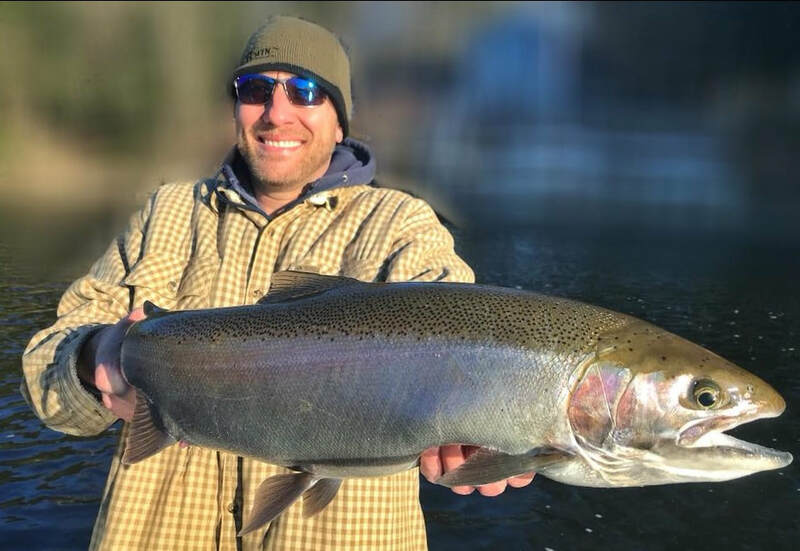 Betts Guide Service prides itself on being able to offer you some of the best winter Steelhead fishing on the Muskegon. It has been common to experience double digit hook ups even on some of the coldest winter days. 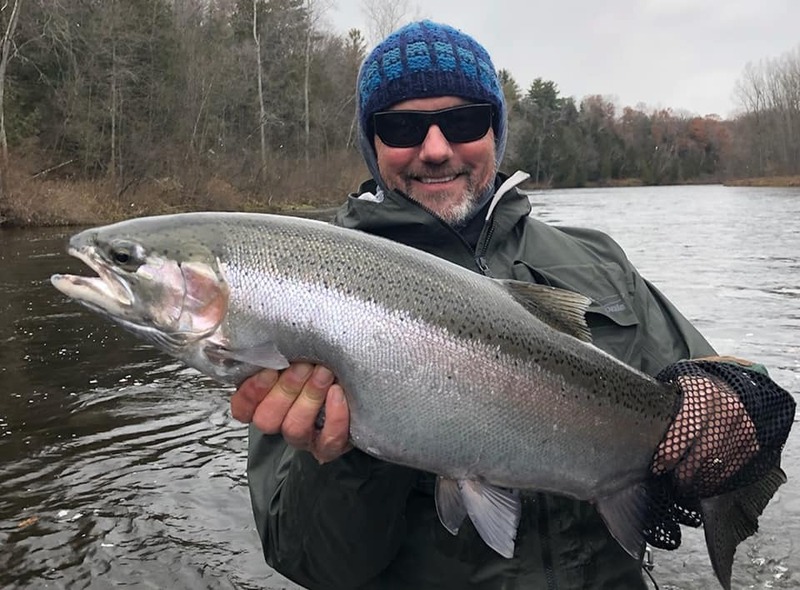 If you have never experienced the sheer tranquility and peacefulness of winter Steelhead fishing on the Muskegon River, give us a try; it’s a great way to shake the winter blues in Michigan. Beginning in late February, the winter Steelhead move up river and begin their migration to their spawning areas. During March, April, and May Steelhead begin to polish gravel and begin to spawn. During this time, Fly Fishing for Steelhead is at it’s best. Anglers can visually seek Steelhead and make casts to the spawning Spring Steelhead. Sight fishing to Steelhead on gravel and watching them take flies makes for a very exhilarating experience. 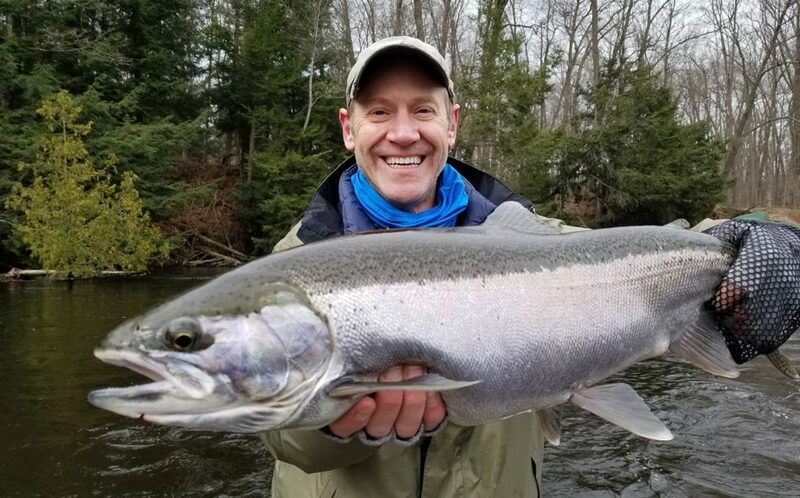 Good numbers of bright steelhead in the Muskegon River from Thorn apple access to Pine St.
Water levels have been dropping and clearing rapidly making for some world class steelhead fishing. 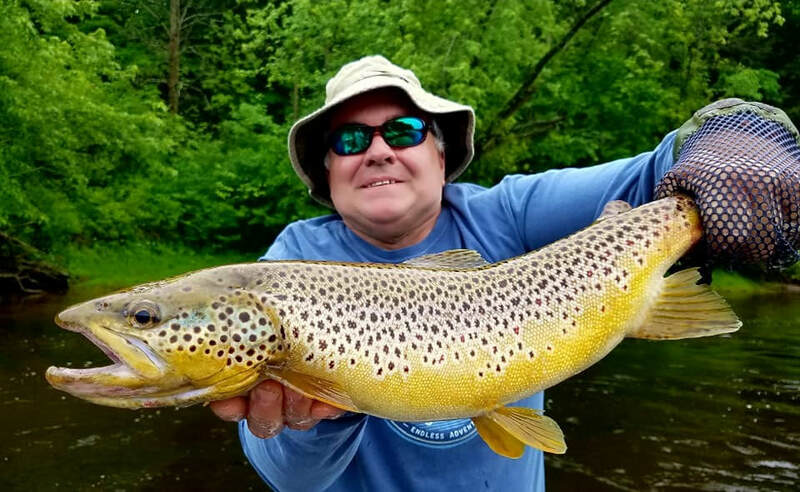 Cloudy, over cast days have made for exceptional fishing with good numbers of throughout the Muskegon River system. Large pods, or groups of steelhead moving up river daily. It may be possible to hook 15 plus steelhead in one spot, and many of the other locations, not have many fish. There are also plenty of steelhead of gravel now. Fly fishing to spawning steelhead on gravel (Sight Fishing) is going strong. For those of you that fish near the Croton Dam, the Michigan DNR will be shocking walleye from Croton Dam through the Pine St. area. The DNR shock boat generally stays above the Pine St. Boat launch. Phenomenal Spring steelhead is finally going strong right now. Water clarity, and water temperatures are absolutely perfect for fishing steelhead at this time. Muskegon River Stream flow – 1800 cfs. (Excellent wading) Clarity – Gin Clear Water Temp – 37 degrees. Bob and Don really got into ’em the past couple of days. Finally some Spring Steelhead fishing on the Muskegon River. Large chartreuse spawn sacks have been key! We saw our first Robin this morning! Spring has sprung and steelhead fishing is in full swing. Water levels are absolutely perfect. The Muskegon River has a nice 3′ – 4′ stain but is mostly clear now. Water levels are premo and hold their own at 3320 cfs. Brighter colored baits and beads have been fishing the best. Spring Steelhead fishing is now in full swing! Water levels are perfect with lots of new fish in the upper river. Grace displays a gorgeous hen from the Muskegon River. Spring Steelhead fishing is excellent right now! Spring Steelhead fishing is in full swing now! Recent flood waters have now receded on the Muskegon River. Water levels are now near perfect. 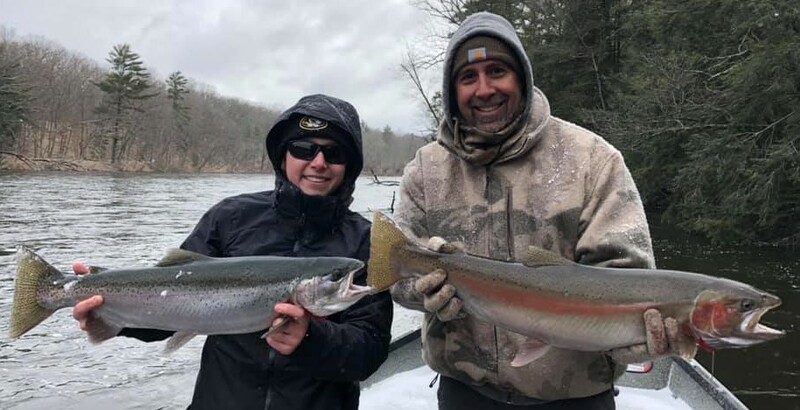 There has been a big push of fresh chrome fish in the upper sections near the Croton Dam. Decent numbers of fresh spring steelhead near the dam. 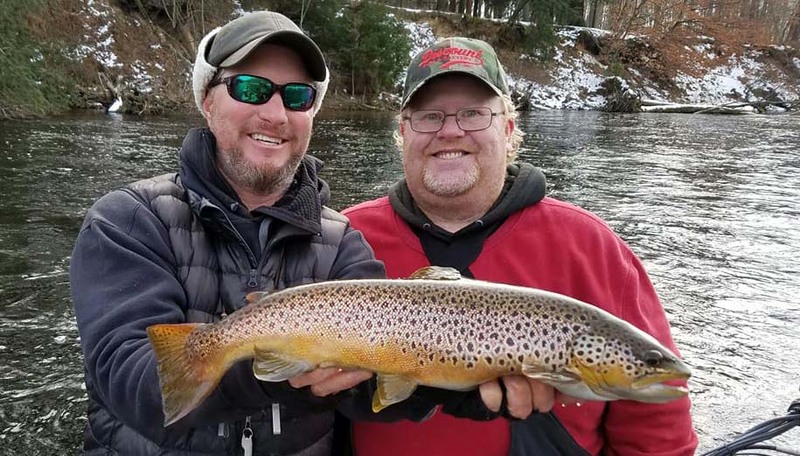 As water levels begin to drop, there should be more spring fish entering the river, and heading for the upper gravel sections of the Muskegon River. Best steelhead fishing techniques have been bright colored trout beads underneath a float. Bobber fishing has been the way to go lately. Jigs and wax worms continue to put lots on fish in the net during high water. Larger, brightly colored jigs have been working well. Spawn sack of fresh scraped steelhead skein are awesome during high water periods, where scent is the key! Spawn sacks in hot pink and chartreuse have also been producing some great fish.